The weekend at the end of October is a bank holiday weekend in Ireland, for no particular reason at all. Even if Hallowe’en falls a few days later in the week ahead, it is still known as the Hallowe’en weekend. Those of us of a certain age also know it as Michael O’Leary’s Weekend since was introduced 40 years by then Minister for Labour Michael O’Leary to the delight of workers in 1977 and as a surprise to his cabinet colleagues and employers. Richie Ryan, who was Minister for Finance at the time, tried to have the decision reversed by the cabinet the following month. The extra day off work was equal to a 0.5 per cent increase in wages, and was probably introduced because O’Leary knew he could not get the backing of Liam Cosgrave’s cabinet for a May Day holiday. A bank holiday at the very end of October is about as far away from May Day as you can get in the calendar. 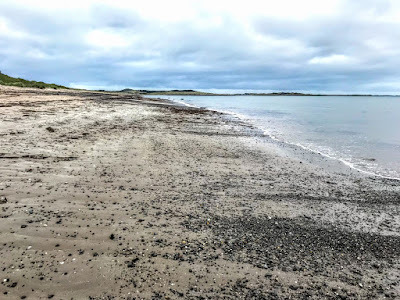 And there was no Spring feeling in the air this Bank Holiday weekend as two of us set out for a walk on the beach and to visit Castlegregory is on the north side of the Dingle Peninsula. Castlegregory is halfway between Tralee and Dingle, and outside the summer season as a population of about 250. The Parish of Castlegregory includes most of the north-east portion of the Dingle Peninsula. In summer, the village is a popular holiday resort, with spectacular beaches on the Maharees Peninsula and golf and facilities. Castlegregory is named after a castle built in the 16th century by Gregory Hoare, a local power-broker. The castle was destroyed during the Cromwellian wars in 1649. There are, however, a few stone fragments. Many of the tragic romantic stories about the castle are fictitious inventions. Some say that before the Great Famine was a town. Castlegregory is at the foot of a sandy peninsula known as the Maharees. This peninsula is a sandy pit for much of its length, with sand dunes giving way to earth and rocky ground near the north end. The sand dunes create a unique ecosystem, and there are lengthy beaches on both sides of the peninsula, which separates Brandon Bay to the west and Tralee Bay to the east. The Brandon Bay beaches are open to the North Atlantic and often receive long rolling swells that can provide excellent surf given suitable wind and tide conditions. 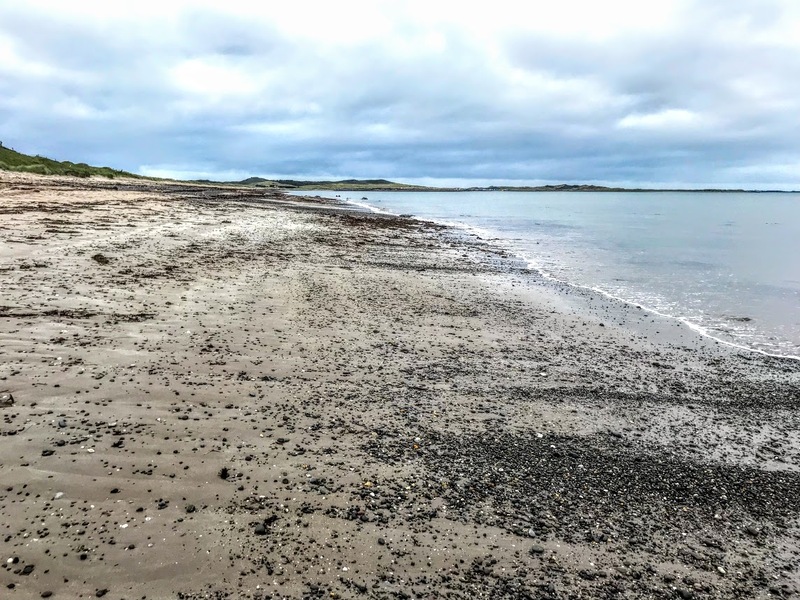 The peninsula is dotted with campgrounds and caravan parks and contains three hamlets – Fahamore, Kilshanig and Ceannduiche – that are home to local pubs and restaurants. Off the peninsula are a number small islands, known as the Maharee Islands, or the Seven Hoggs, which is also the name of a local pub. On the largest of the Magharee Islands, Illauntannig (Oileán tSeanaigh), the ruins of a seventh century monastic site founded by Saint Senach include two oratories, three beehive or clochan huts, and three examples of a leacht or altar. Castlegregory was the terminus of a branch line of the Tralee and Dingle Light Railway. The railway station opened on 1 April 1891 and closed for passenger and goods traffic on 17 April 1939, although a monthly Tralee-Dingle cattle train continued until the main line closed in 1953. 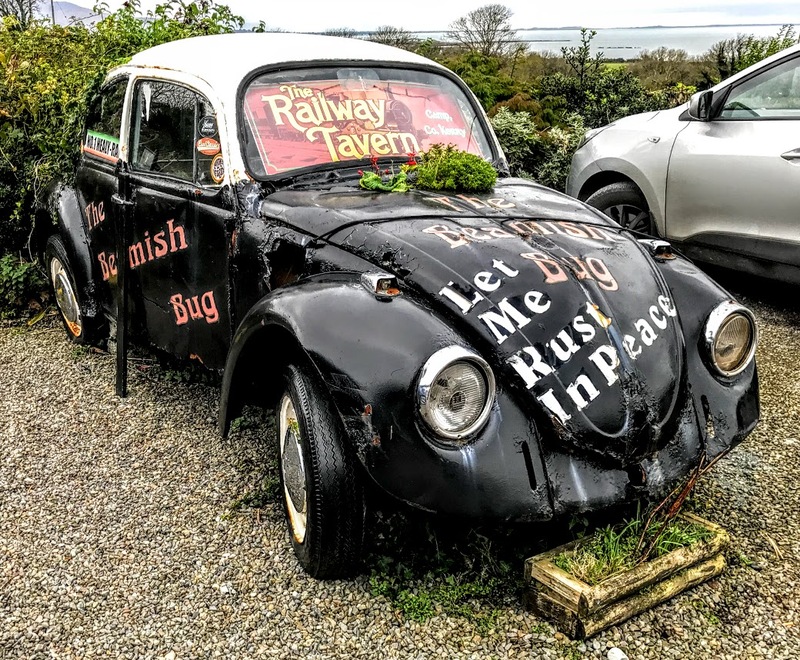 On our way back to Tralee, we stopped at Michael O’Neill’s Railway Tavern in Camp, a traditional musical pub that is also a reminder of the railway line that once linked Dingle and Tralee. 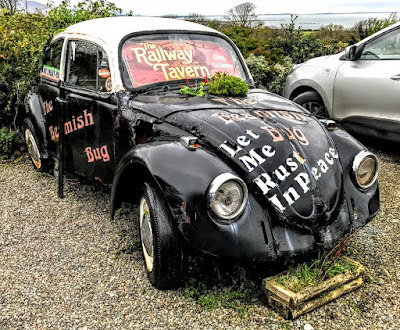 Earlier, on our way to Castlegregory, two of us stopped at Blennerville (Cathair Uí Mhóráin, ‘the town of the Morans’), about a mile (1.6 km) west of Tralee on the N86 road to Dingle, where the River Lee enters Tralee Bay. Blennerville was once the port of Tralee, and is connected to the town centre by the Tralee Ship Canal. There is local speculation that this was the ancient site of the Tramore ford, the only escape route afforded to the 15th Earl of Desmond from Tralee towards the south, before his capture and execution in 1583. The name of Blennerville was given by Sir Rowland Blennerhassett (1741-1821), 1st Baronet, who made this his residence. A bridge was built at the site in 1751, and in 1783 Sir Rowland Blennerhassett renamed it Blennerville after his family. 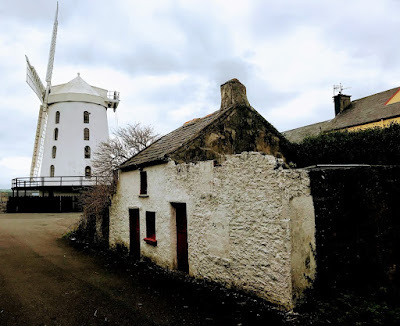 Blennerville Windmill, Ireland’s only commercially operating windmill, was built in 1800. For most of the 19th century, the port at Blennerville was used by emigrants as a gateway from Kerry to North America, and the Jeanie Johnston was the most famous of these ships. When the Tralee Ship Canal opened in 1846, Blennerville lost its place as Tralee’s port. The village went into decline, and the windmill closed and fell into ruins. The Tralee and Dingle Light Railway opened in 1891, connecting Tralee and Dingle on one of Europe’s most western railway lines. A station operated at Blennerville until the line closed in 1953. Blennerville Windmill was bought by Tralee Urban District Council in 1981, and it opened to the public in 1990. Hallowe’en is not until Tuesday evening, but Michael O’Leary’s Bank Holiday weekend continues tomorrow. 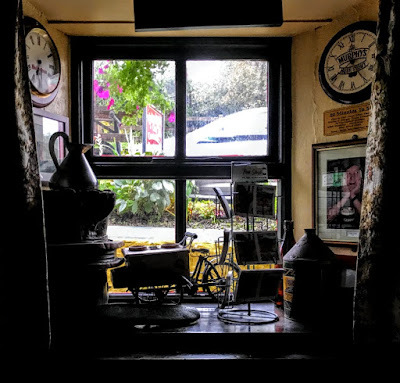 The clocks went back last night, and, as we like to say in Ireland at this time of the year, you would notice the evenings are beginning to close in.